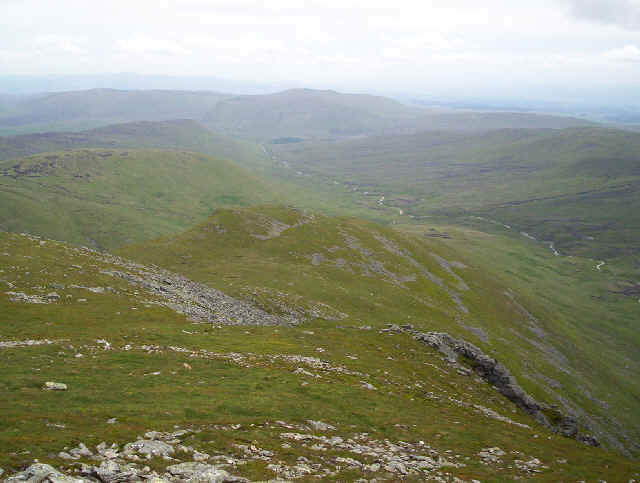 Climbing these two hills is normally undertaken from Loch Earn. However, as I don't bring my car up to Scotland, and prefer to rely on public transport, there are only two practical alternatives. 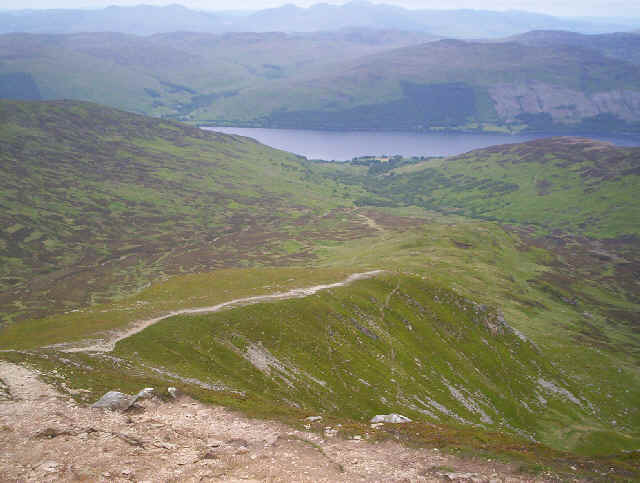 The first relies on taking one of the relatively infrequent buses that go to Lochearnhead and then walking to the beginning of the walk at Ardvorlich. 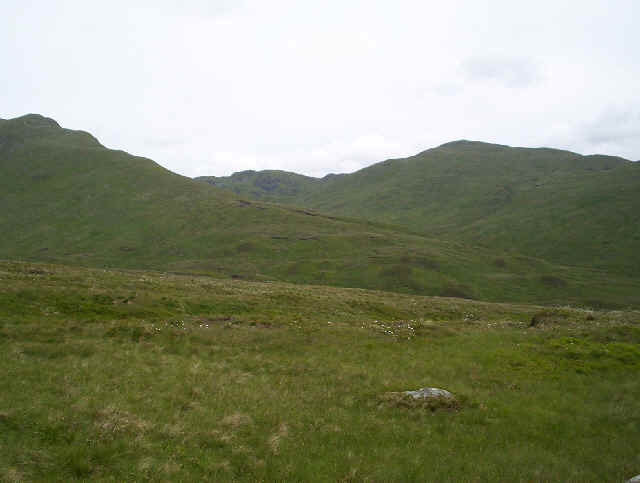 The second is to walk from Callander. It's quite a long walk in and there's a potential problem with the missing bridge over the Keltie Water at Arivurichardich. Despite this, I decided that the only practical way for me was the walk out from Callander. Thus on 21st June 2008, the longest day of the year, I caught an early bus from Stirling, having stayed overnight at the youth hostel. An 8.30 start from Callander, on a rather pleasant summer's morning, found me heading up the lane bound for the end of the road at Braeleny farm. An hour's walk saw me past the end of the paved section of the road. If you decide to drive this far that's two hours saved on the day's walk. However, I found it a pleasant and very quiet road to walk along. 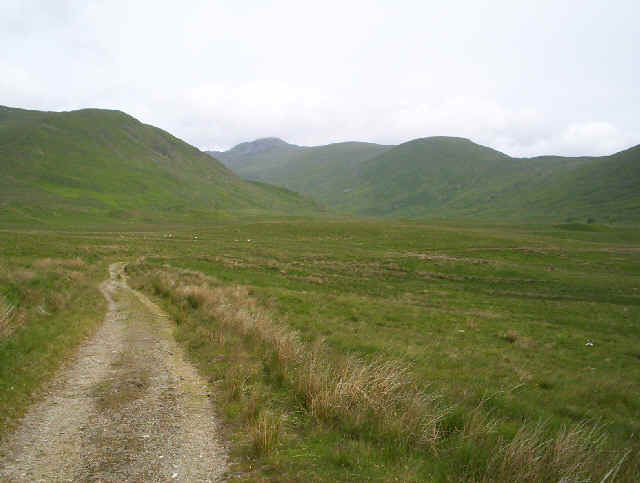 The first view of Stuc a'Chroin comes shortly after leaving Callander. It was clear that I wasn't going to have too much crossing the river, given how little water was in the river. Even this far down the valley I think you could have crossed dry-shod. Braeleny Farm, where the paved road ends can be seen here. Beyond Braeleny the lane becomes unpaved and the early morning mist has almost cleared the summit of Stuc a'Chroin. 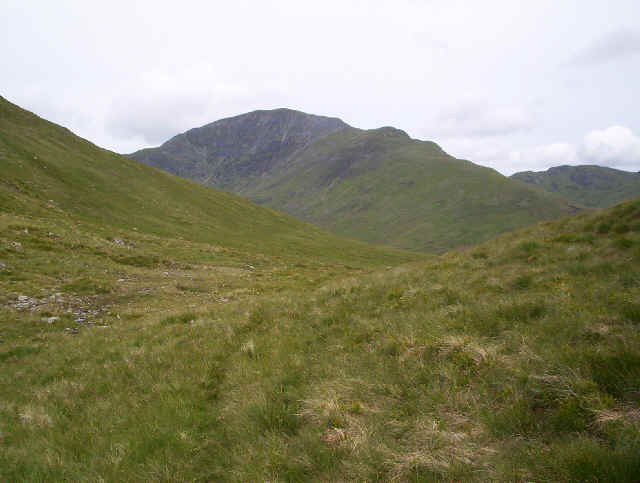 The Gleann a'chroin lies in between the two ridges that lead up to Beinn Each on the left and Stuc a'Chroin on the right. 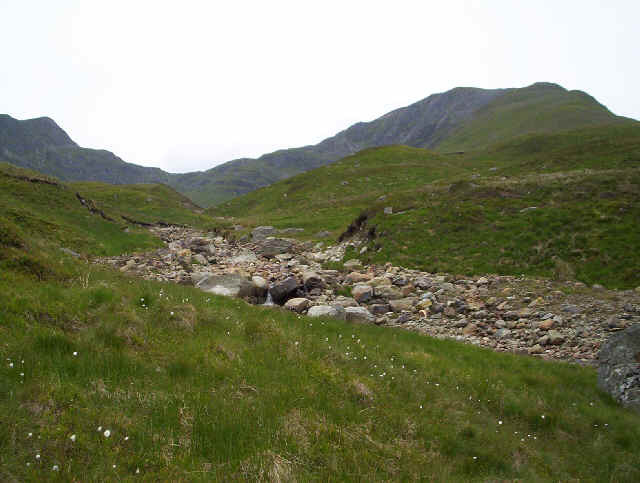 In August 2004 the bridge over the Keltie Water was swept away in a storm. The steel girders still lie on the banks at the right of the photo. 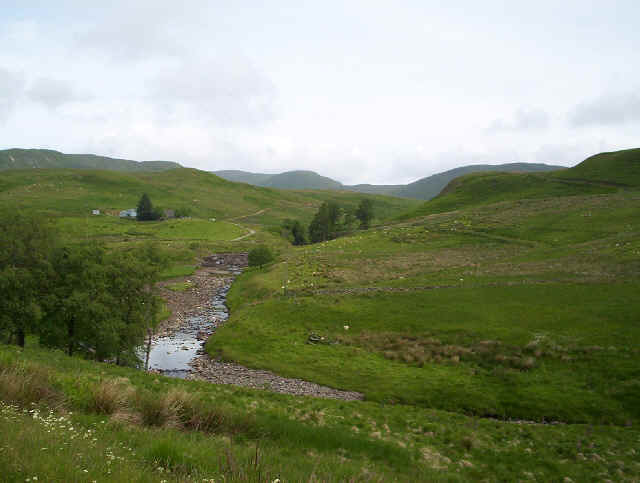 A sign at Braeleny warns of the missing bridge, with the Lomonds and Trossachs National Park promising that they are investigating repairing it. The best place to cross the river now appears to be upstream of the bridge. 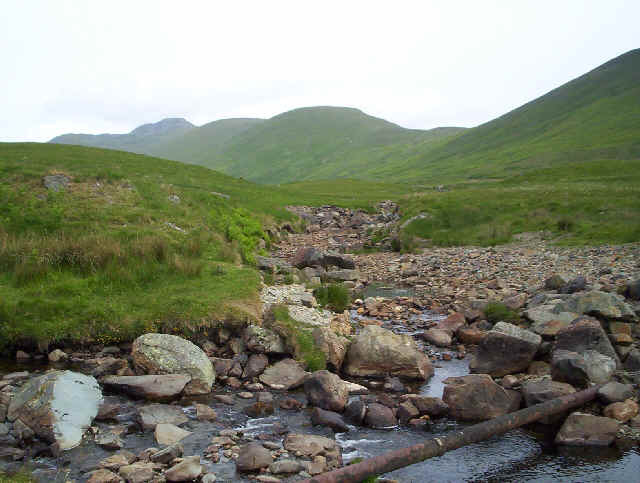 I made the crossing in two stages; first over the Allt Breac-nic on the left, and then the Allt a'chroin. 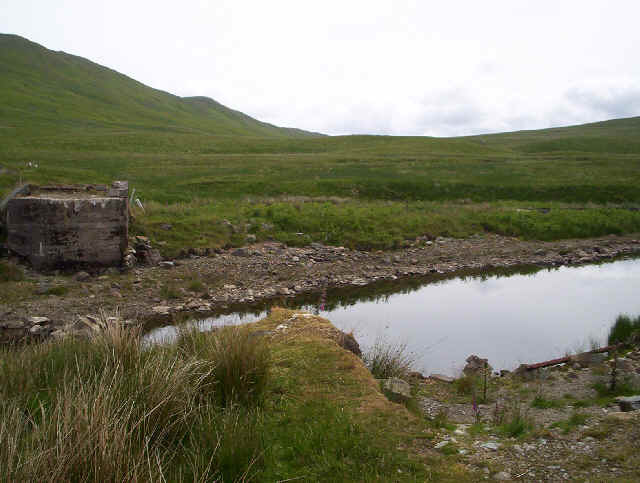 There are plenty of stones, and it looks as if someone has tried to build a series of proper stepping stones over the Allt a'chroin. I didn't even get my boots wet in this very dry June. In spate conditions reports on scottishwalking.com tell another story. Clearly it pays to wait for a dryish spell to attempt this walk. Once beyond the river the vehicle track continues to the old farm buildings at Arivurichardich. The path goes to the left of the buildings through some very small field walls and then starts to climb up hill through bracken. 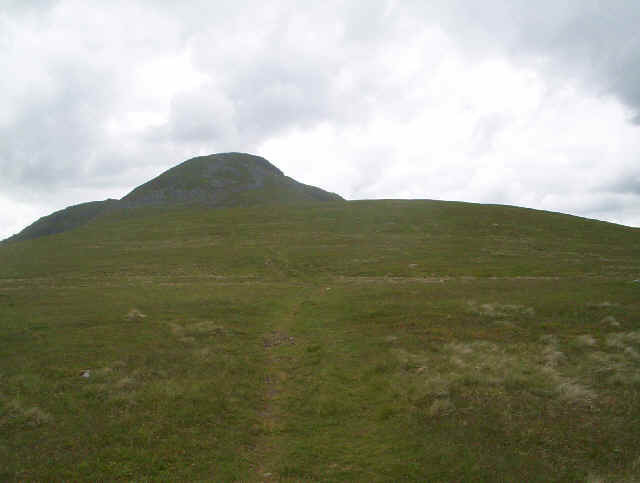 The path climbs towards the col at Meall h-lolaire. 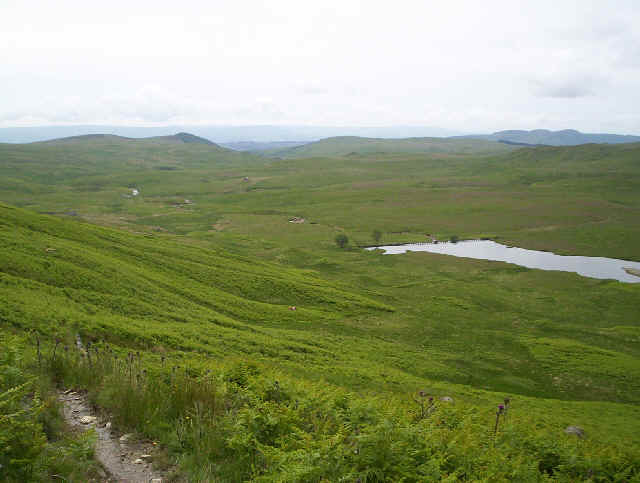 Looking back down towards the Keltie Water and the Arie Dam. 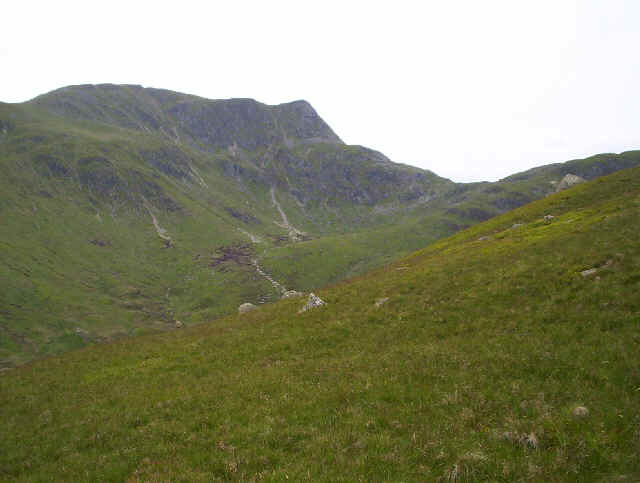 At about NN638 155 I left the path to Stuc a'Chroin and headed for the depression just to the west of the spot height of 603m on the Harvey's map. 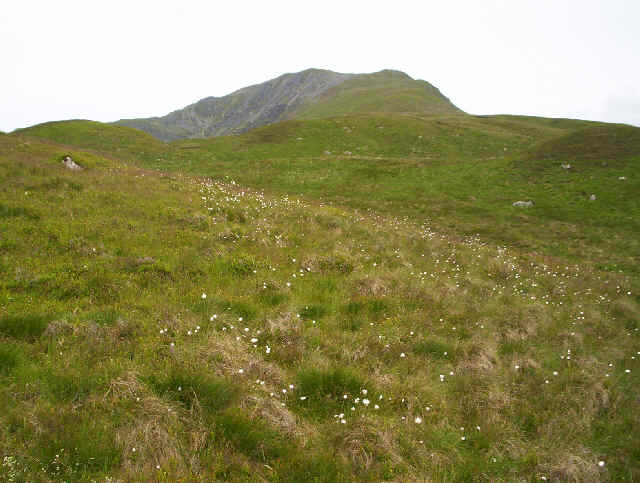 There is an area of peat hags here but this is soon passed. 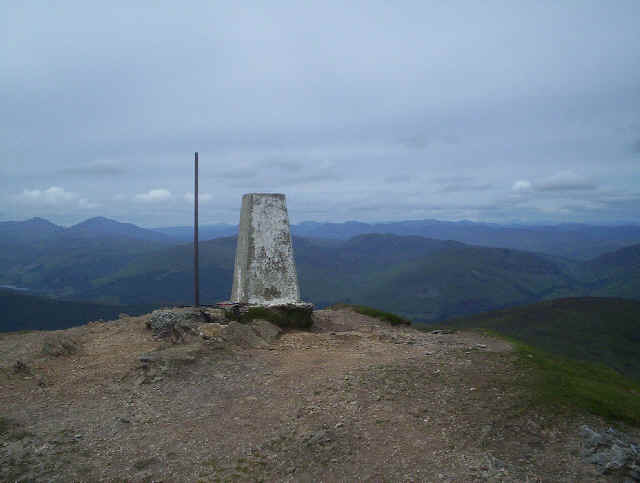 To reach this point had taken two and a half hours from Callander and I was forty minutes ahead of time on my route plan! 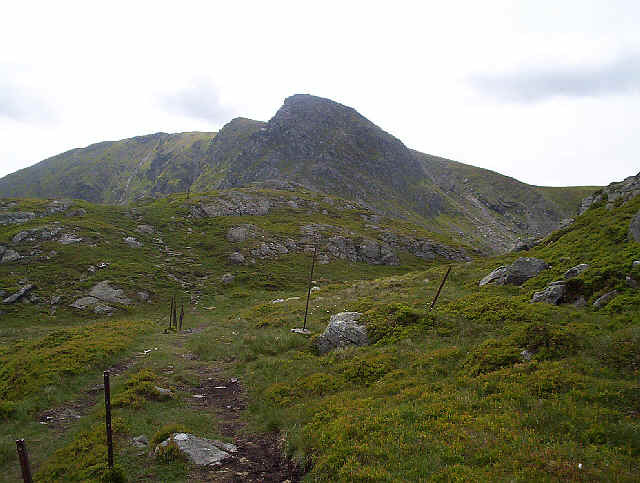 ......and soon Stuc a'Chroin's summit appears to on the left. There are odd sections of what might be a path . The O.S. 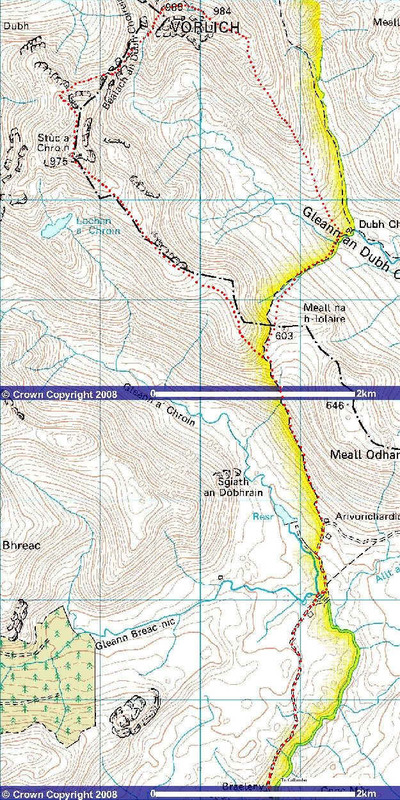 map shows a line of grouse butts running parallel to the small stream that runs down into the glen, although I saw no evidence of them. 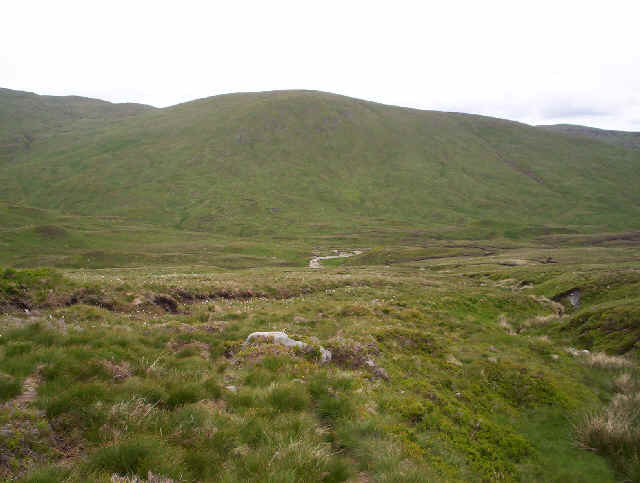 I'd decided to make my way down to a point just upstream of where the Allt an Dubh Choirein meets the Allt a Bealach Gliogarsnaich and then head up the ridge to Ben Vorlich. The crossing of the Allt an Dubh Choirein (at NN64290 16600) was even easier than the other streams although, looking at the size of some of those boulders, I wouldn't like to be here when this is in spate. I'd taken exactly three hours to reach this spot from Callander. 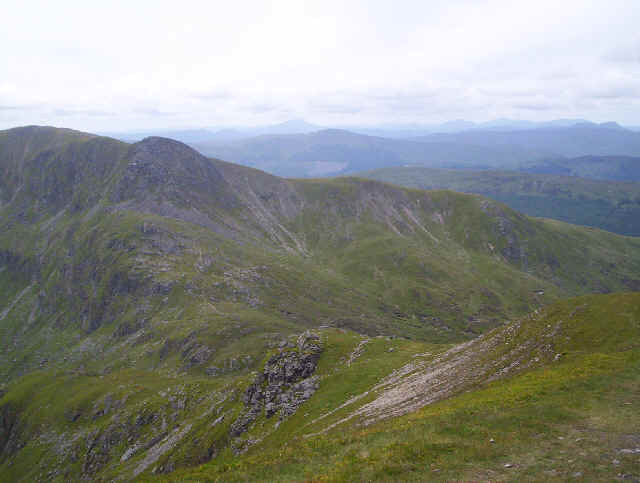 The long south east ridge of Ben Vorlich stretches uphill from Dubh Choirein. 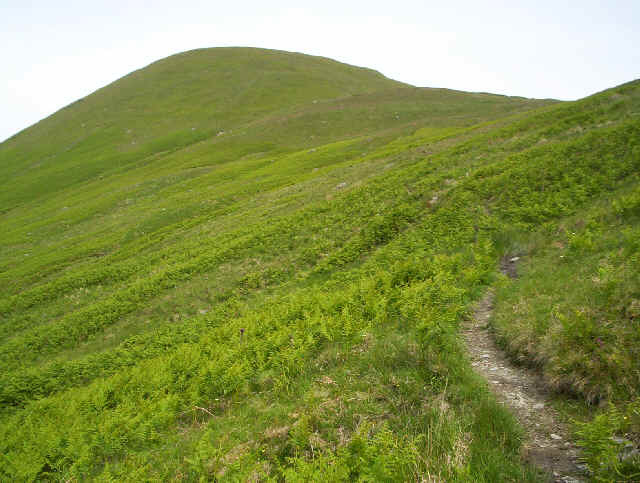 There's no path to start with and in places the climb is tiresomely steep. 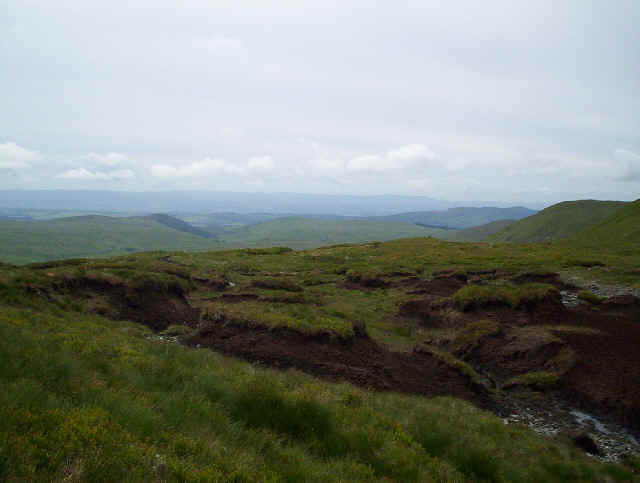 There are quite a lot of deep peat hags which would make this section quite difficult if the hillside were wet. 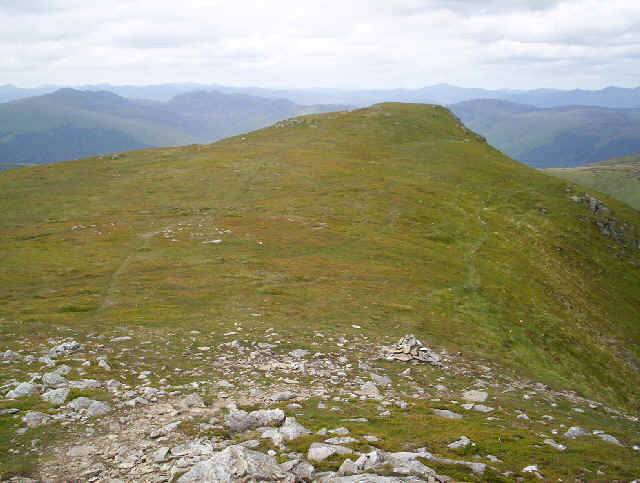 Looking back down the ridge into the Gleann an Dubh Choirein. The hills in the distance are disfigured by wind turbines, the tops of which appear above the skyline. 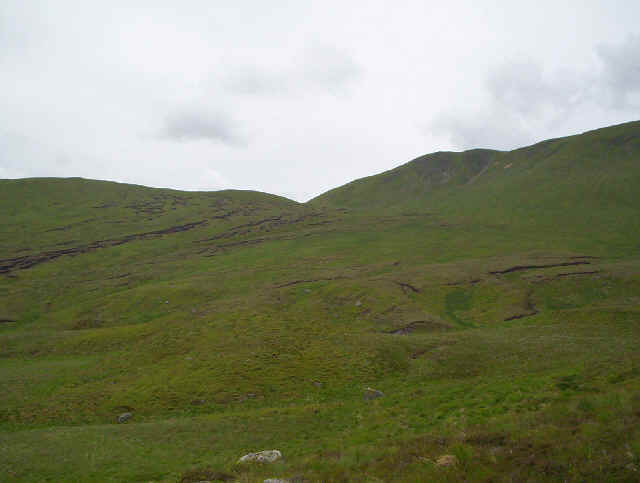 Sections of the climb are quite steep as this photo shows; to the rights is the Bealach Gliogarsnaich. 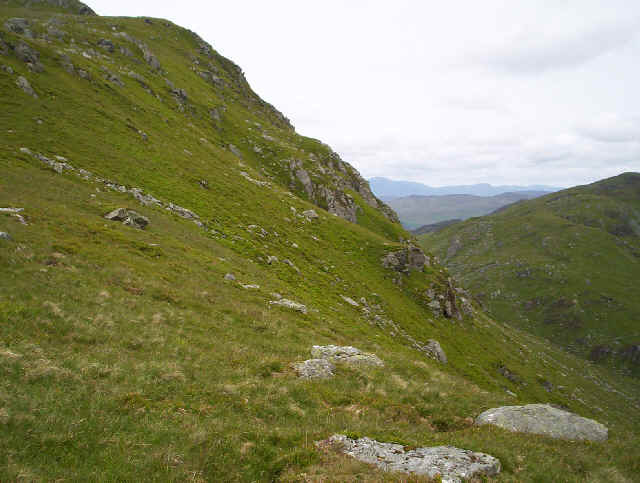 I found the track up the ridge at NN63877 17700 and from then on progress was easier. 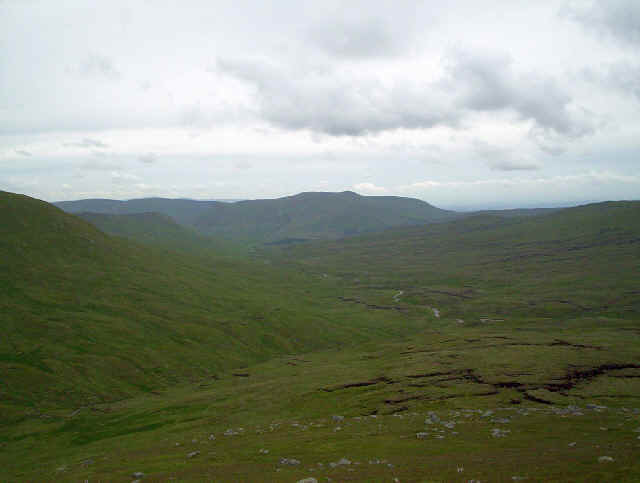 Across the glen Stuc a'Chroin looks pretty formidable. At last the summit comes into view. 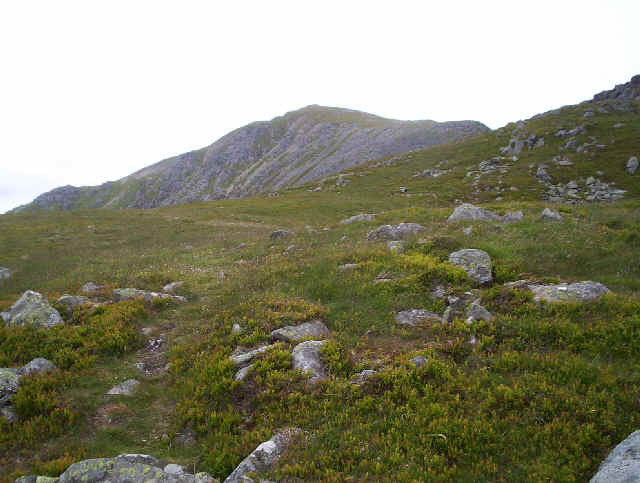 The summit dome of Ben Vorlich towers above the path. 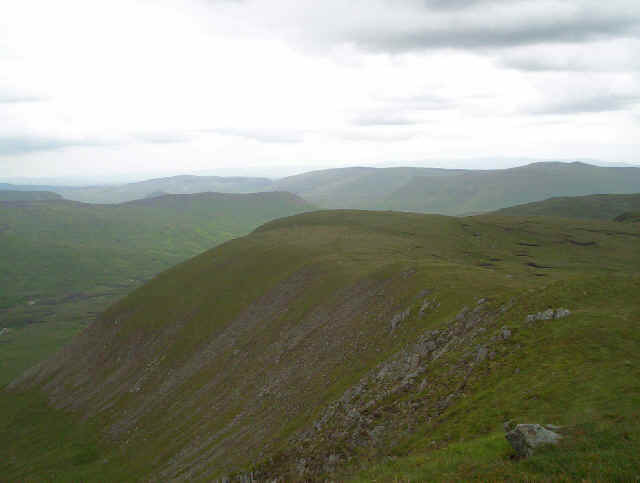 looking back down the south east ridge. The path arrives suddenly at the summit ridge. 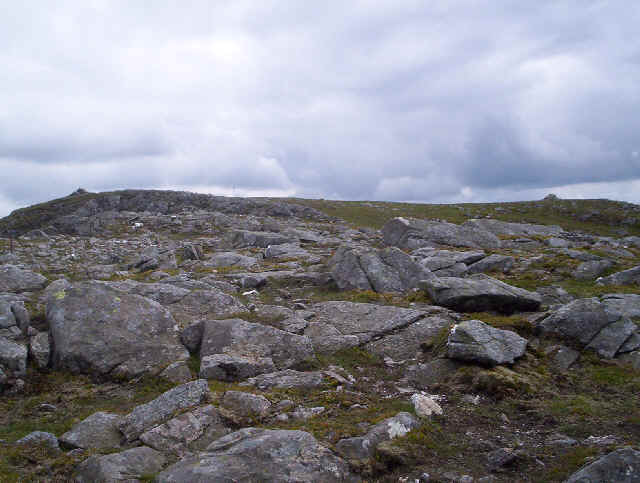 This short section has a cairn at the south east end and the trig point at the north west. I was lucky; the views were stupendously good and well worth the effort of the climb. Four and a half hours out of Callander the whole of the mountain panorama was visible. 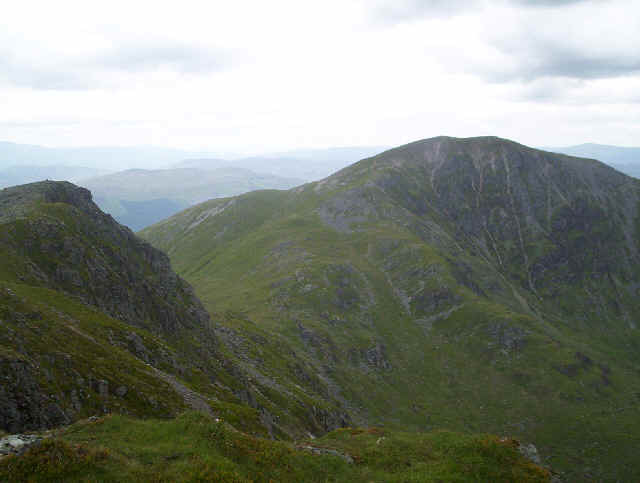 This stunning view stretches from Stuc a'Chroin on the left around to the ridge leading up to stuc a'Chroin on the right. Clearly visible was Ben Nevis and the Cairngorms. To see the photo full size click on the image and when a new image opens click on that to see it full size. Click on this link to see the northern panorama and the southern panorama in diagramatic format together with names and distances. Despite it being rather windy the sun was still shining and I found a spot out of the wind to eat my lunch and send a text message to my wife. I also sent a test message using my latest "toy" a SPOT satellite personal tracker. These devices will send a message even if there's no mobile reception - very reassuring if you walk alone. I've discovered that there are limitations to their use, so I pass these tips on. First make sure that you turn SPOT on for 5-10minutes before sending a message. The orange front of the tracker must face the sky. To send an OK message press the button. The two lights will flash on and off together. After some time - about 30secs to a minute or so seems normal one light will glow constantly for a few seconds and then recommence flashing. If the two lights flash together the message has been sent but if the lights flash alternately the message hasn't been sent and the SPOT will try again. It appears, in my experience, that a message will not be sent reliably if you are walking at the same time. 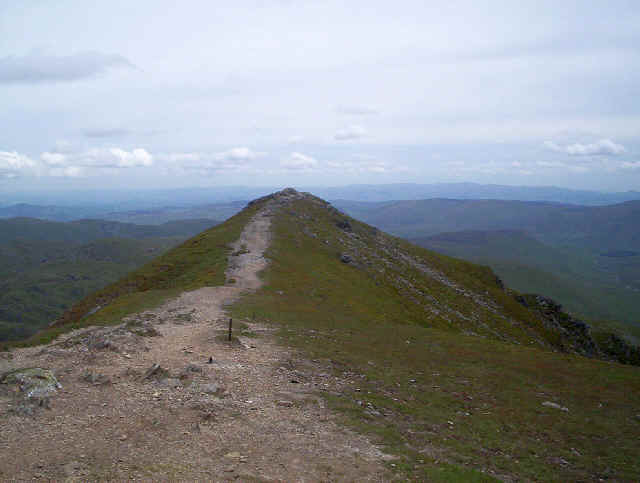 To continue on to Stuc a'Chroin the way heads down the west ridge of Ben Vorlich following a line of metal fence posts. 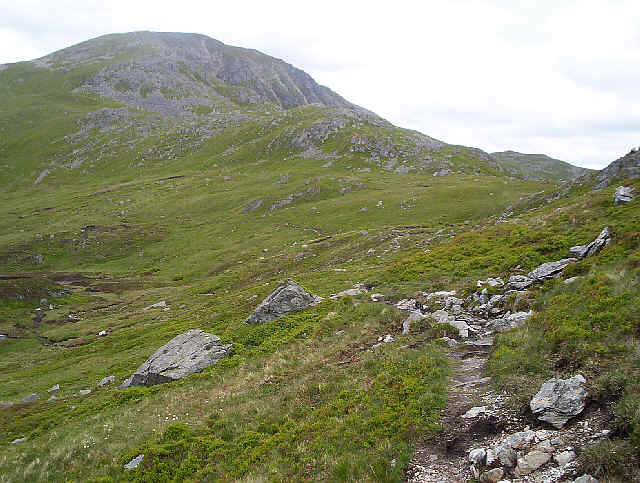 In places the path is quite heavily eroded but the mountain landscape is simply stunning. 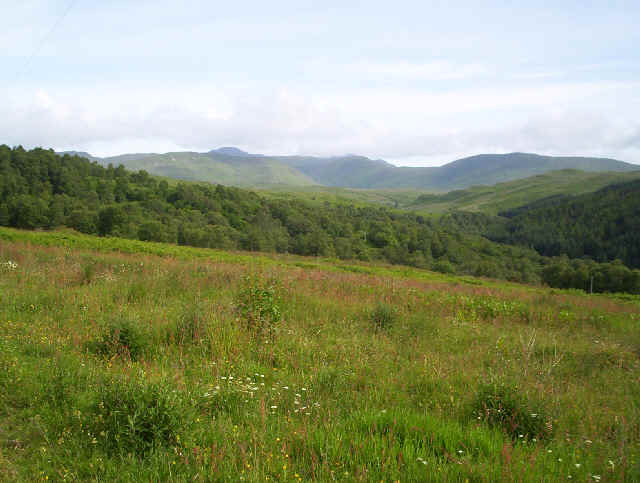 It's hard to appreciate that this is the very southern edge of the Highlands. Going down to the Bealach an Dubh Choirein I realised it would soon be decision time as to which way I would take up Stuc a'Chroin's face. ......reach the lowest point. There are three possible approaches. The route for heroes and "nutters" straight up the rocks scrambling over the boulders. 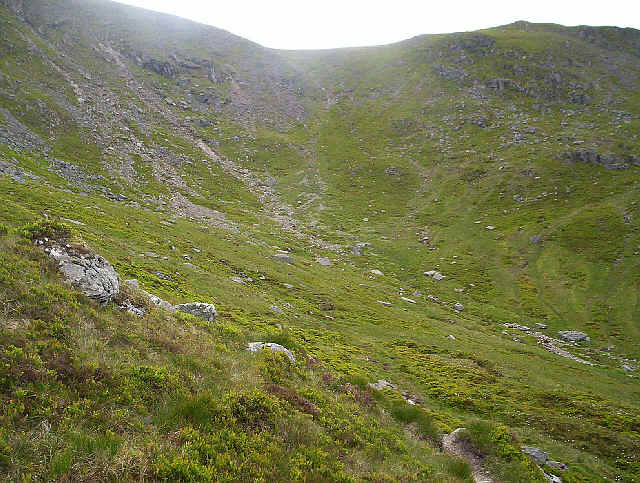 A steep gully to the left of the buttress. 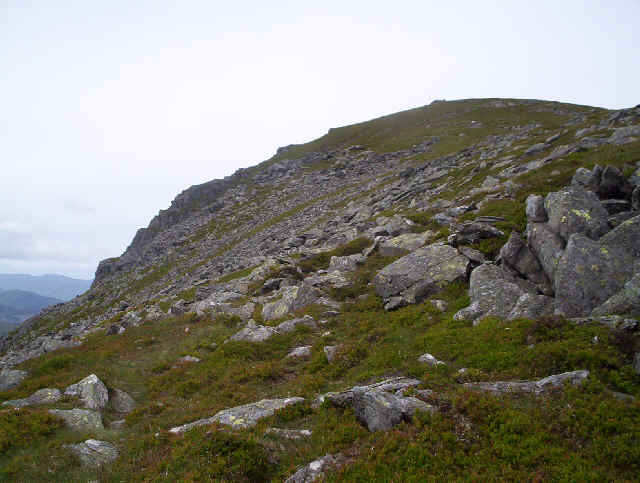 A route to the right which climbs relatively gently at first and then a little more steeply to reach the north west ridge. Not enjoying heroics I opted for option three! 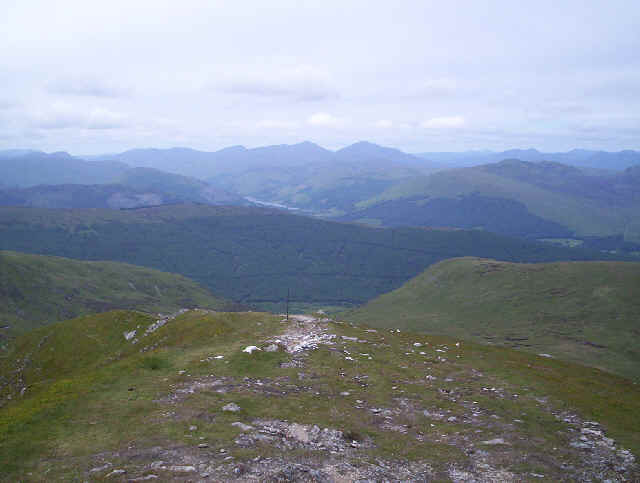 This is the view looking back to Ben Vorlich from the beginning of the option 3 path. 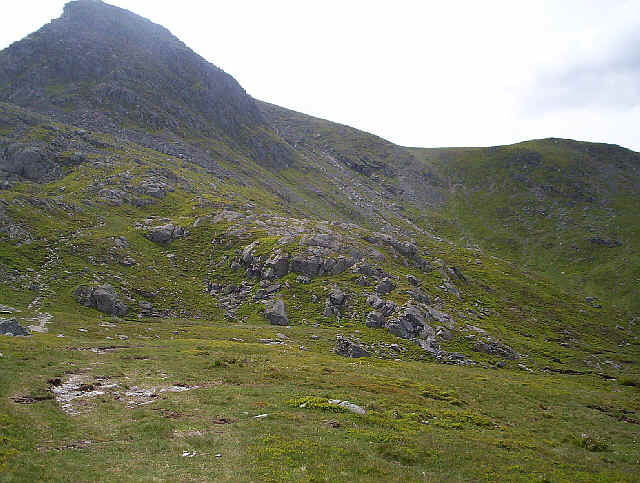 Looking back to the bealach from near the top of the path to the ridge. 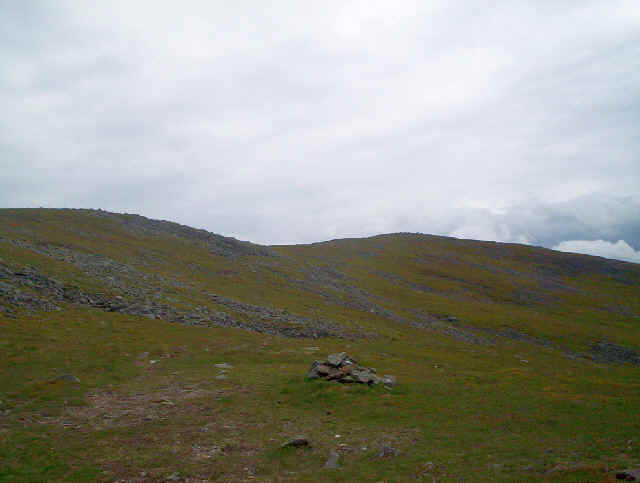 The cairn (at NN61575 18071) marks the spot where the path from the bealach reaches the ridge. .......before becoming more stoney. 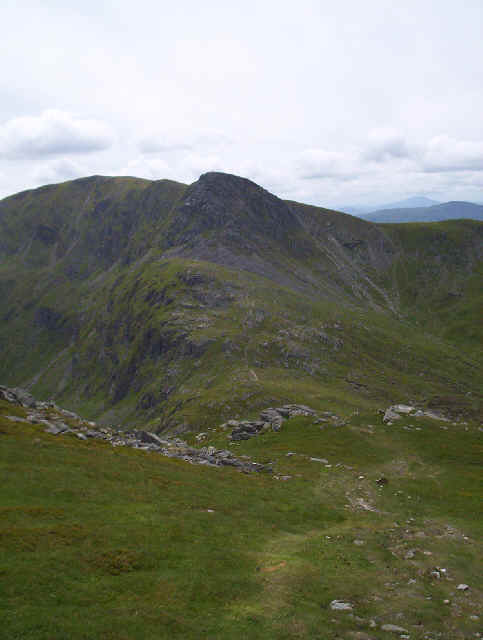 Here the two cairns at the summit mark the ascent of Stuc a' Chroin. 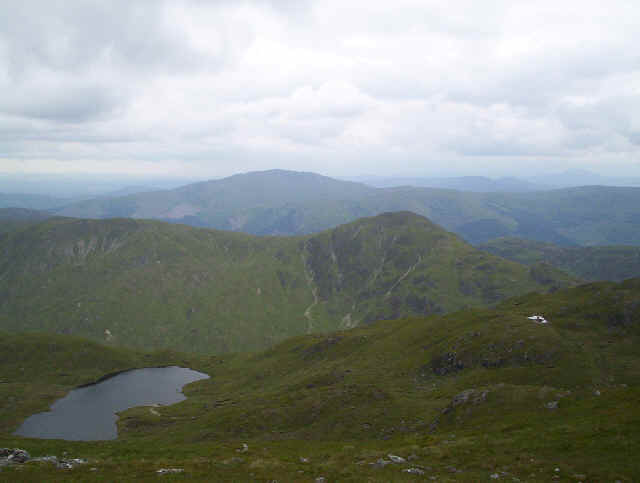 It had taken me just and hour and a half from Ben Vorlich; as usual I stopped to chat with several people on the way. It's amazing how many interesting people there are on Scottish hills and how friendly they are. They do slow you down though!! 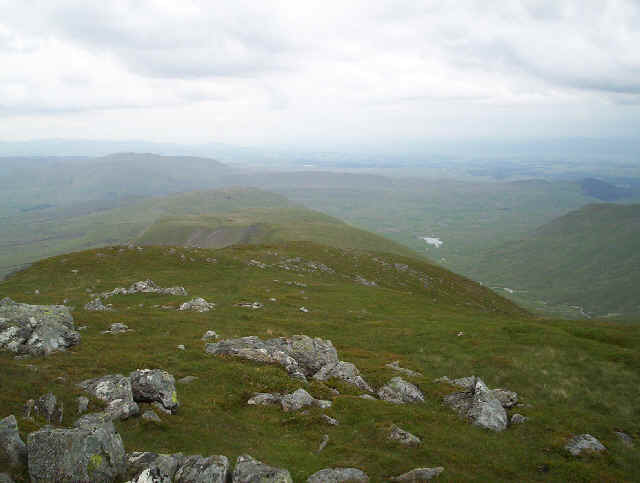 Looking back from the summit of Stuc a'Chroin with Ben Lawyers in the distance. After a break for chocolate and a drink it was time to head downhill. By now the weather was beginning to change; it certainly didn't feel as warm as earlier. 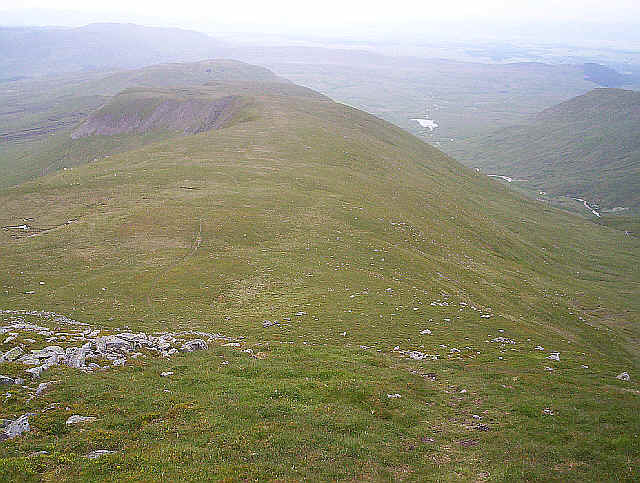 The south east ridge stretches into the distance. 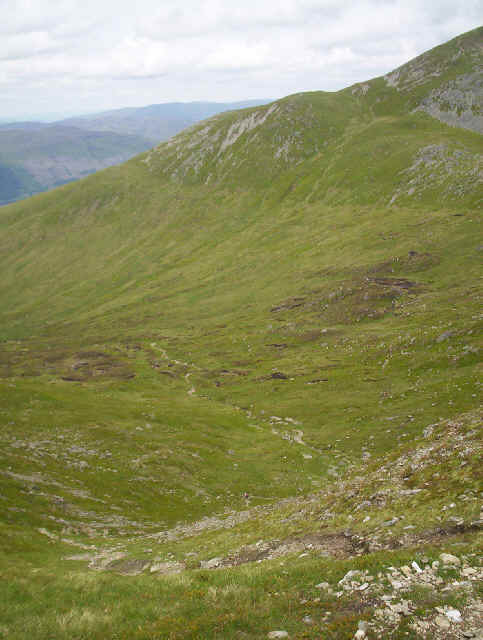 Ben Vorlich's cliffs dominate the scene on the first section downhill. I've digitally lightened this photo to show the route down. There's a clear path the entire way and it's very easy walking. I started to muse over whether it might not be better to climb the two hills in reverse order, but came to the conclusion that it really doesn't matter. 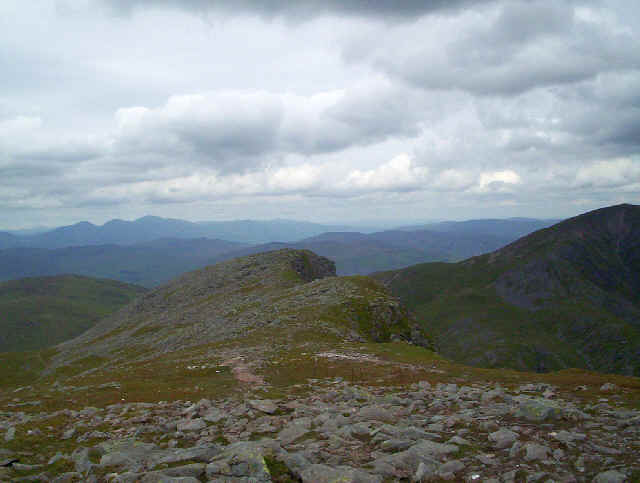 A look back to the doomed summit of Stuc a'Chroin. There's not much to say about the return to Callander. 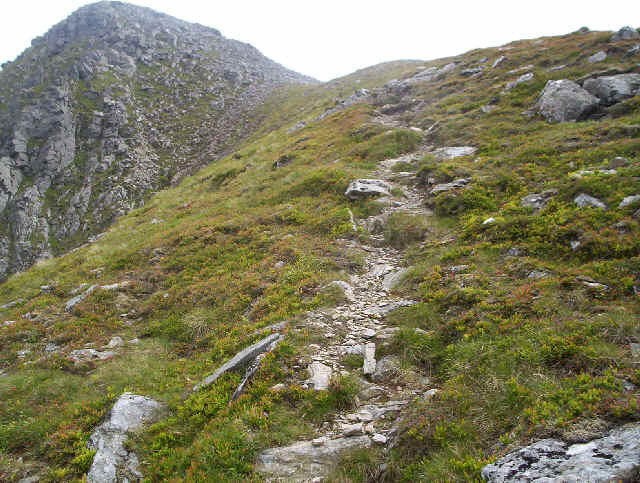 The ridge path heads downhill at a a fairly constant rate, with one or two steeper sections. I wanted to be in Callander for a meal and to catch a bus back to Stirling so it was very much walk quickly but carefully where possible and slowly and very carefully where necessary. Two hours and forty minutes saw me back in Callander, although I did waste time putting on my waterproofs when it looked like it would rain hard so two and a half hours would seem easily possible. Overall, include several longish breaks for snacks and drinks the walk had taken just over nine hours. 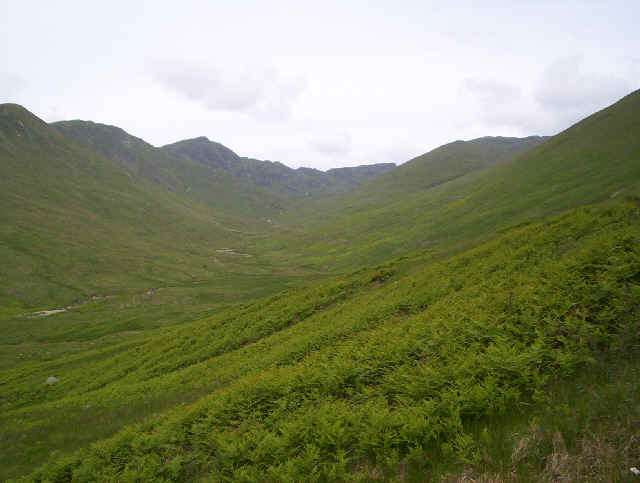 For those using a car to get to Braeleny this would reduce to seven; in my opinion it's a much better walk than the quick up and down from by Loch Earn.